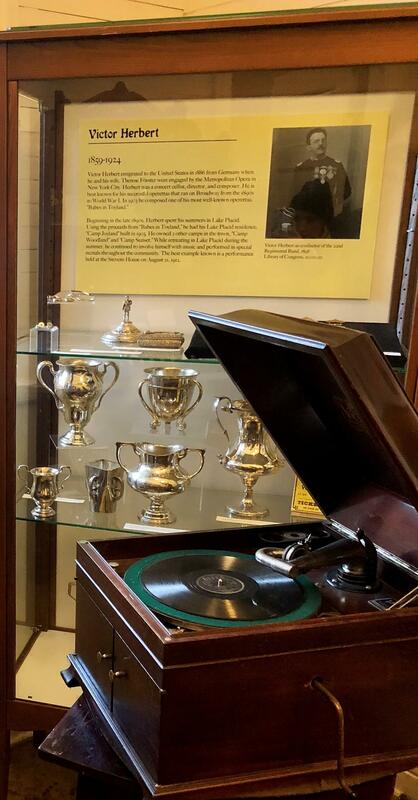 This autumn the Lake Placid-North Elba Historical Society received the unique donation of Victor Herbert’s personal Victrola from a long time seasonal resident. Victor Herbert (1859-1924) was one of the leading composers of his era. He wrote more than 40 operettas, including “The Red Mill,” “Naughty Marietta” and “Babes in Toyland”. This Christmas-themed musical features the vocal piece, “Toyland” and the instrumental piece “March of the Toys”. Beginning in the 1890’s, Victor Herbert and his family were long time summer residents of Lake Placid. In 1905, with the success of “Babes in Toyland” Herbert was able to build Camp Joyland on the eastern shore of Lake Placid and subsequently the nearby Camp Sunset. He then purchased Camp Woodland which lay between his other two camps. The victrola was still “in residence” at one of these camps. It will be on display next summer season in the Arts and Music Room at the Historical Society Museum, augmenting a display of Victor Herbert’s sheet music, awards and his Steinway travelling music stand. The goal is to help visitors more fully engage in the exhibit themes and be totally immersed in their museum experience. Museum goers will be able to access the Lake Placid-North Elba Historical Society website and find the playlists they heard during their visit and enjoy more learning on their own!